The H&K Tubeman Plus Rack Preamp (circa 1993) is a tube guitar preamplifier with optional MIDI controlability. It is a 3 channel amplifier with independant Master Volume controls for each channel and shared EQ controls. The is a shared gain for Clean/ Crunch and a separate gain for the Lead channel which also has a switch to revoice the preamp for a LEAD 2 sound. This preamplifier uses a single 12AX7A preamp tube. Because of some scratchy pots, the owner had used copious amounts of greasy contact cleaner that was leaking out of the chassis. The unit did not have the optional MSM-1 Control board for MIDI Control... just a filler panel on the rear of the chassis. The 2 gain, 4 EQ and 3 Master Gain pots were individually unsoldered from the Tubeman Plus PCB. Then each pot was disassembled and flushed with a non-silicone electronic contact cleaner and subsequently sprayed with a protective coating of DeoxiT D100 before reassembly and re-soldering on the PCB. The pots are now like new, smooth and no scratches or discontinuities. The new MIDI Control Board was installed on new internal chassis stand-offs and connections were made to a custom rear-panel MIDI connector board to replace the Filler Panel. The board is powered by tapping the internal 18 VDC and regulating to 12 VDC for the MSA-R MIDI Control Board. The MIDI option rear plate has MIDI IN, MIDI THRU, a Phantom Power Jack and a MIDI channel selection DIP Switch. The Phantom Power Jack allows the user to feed power back through the MIDI IN jack to a MIDI Footcontroller over Pin 6 and 7 of a 7-pin MIDI DIN cable. The panel was designed by me in CorelDraw and Laser Engraved by AD Engraving in Toronto on an 0.040" thick black-anodized aluminum panel. The stock Tubeman Plus only has a front INPUT. The rear input is very useful for a clean set-up allowing connection of the guitar signal to the rear panel from a wireless receiver or other rack effects without having to loop a cable to the front of the preamp. A hole was drilled in chassis for an isolated 1/4" PHONE JACK connected to the front jack. The jack was wired so that the front jack has priority and disconnects the rear input jack incase the front input has to be used. 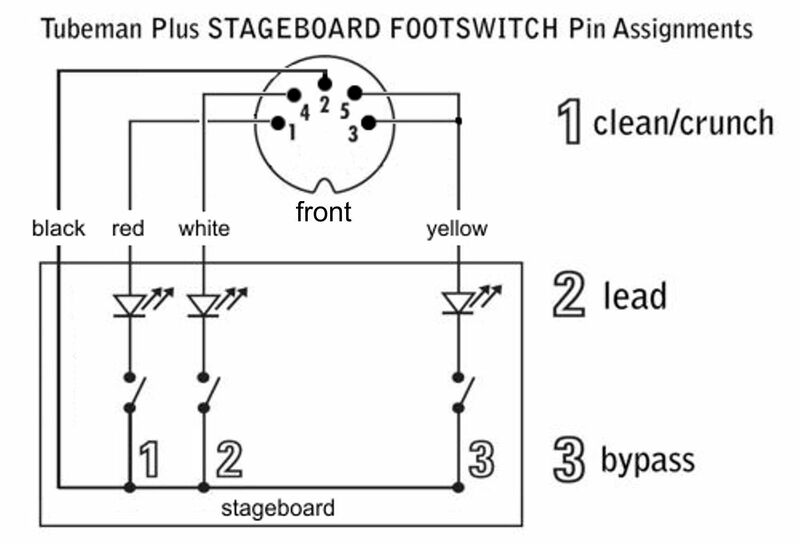 The Stageboard (footswitch), as received, had a few flaws...the footswitch cable had been spliced and re-joined using electrical tape and the crunch/clean footswitch was intermittent. The switch was replaced and the footswitch cable was removed by releasing the Heyco Strain relief. The footswitch chassis was punched to receive a 5-pin DIN connector. On the Preamp side, the 6-pin Rear Panel DIN connector on the was replaced with a more standard 5-pin DIN connector so that the footswitch could be connected to the preamp using a standard MIDI cable.